Using transparent protective covers in luminaires affects light output. Internal reflections in the transparent cover can substantially reduce light output, especially in wider angles. The side-effects of internal reflection can be minimized with proper optical design. This effect can also be used to shape light, for example to reduce glare in street lights. Because most of the blocked light is actually reflected back inside the luminaire, it can be recycled to improve luminaire efficacy. In order to minimize reflection coefficient in the luminaire, transparent covers should be made from material with a low refractive index. The amount of light absorbed by the cover is less than 1% so internal reflections are a determinating factor in reducing efficacy. The thickness of the cover doesn’t have a substantial effect on the light. In the above diagram can be seen the effect that transparent protecting cover has on the light output. Optic used in the comparison is LEDiL’s STRADA-2X2-ME module. 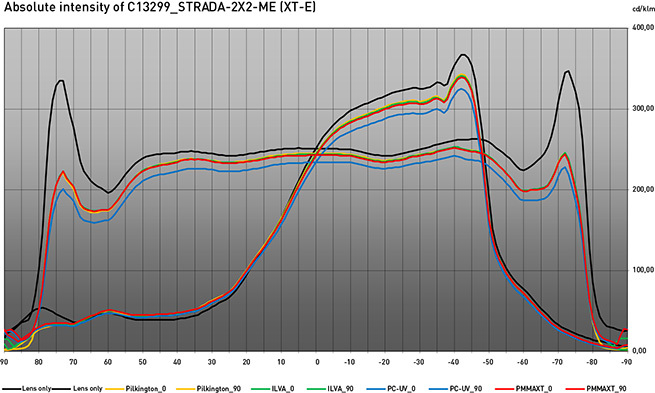 Module is optimised for European ME road lighting class. The effect of the cover is noticeable in the extremities of beam angles, especially in horizontal plane at gamma angles of around 75°. 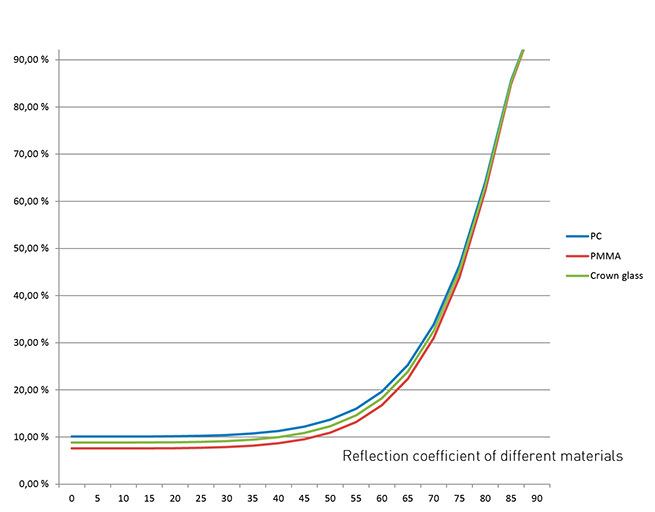 This effect can be used in advantage to reduce glare and achieve acceptable TI figures. Light that is reflected from the cover back inside the luminaire can be recycled to add up overall illumination levels so there is only neglible impact on the overall efficiency. Testing was done with polycarbonate and PMMA cover plates and two different toughened cover glasses from Pilkington and ILVA. Thickness of each cover was 4 mm and covers were mounted 20 mm from the PCB. Test fixture had non-reflective inner surface and light output of the setup was measured with the optogoniometer in 5 degree intervals.